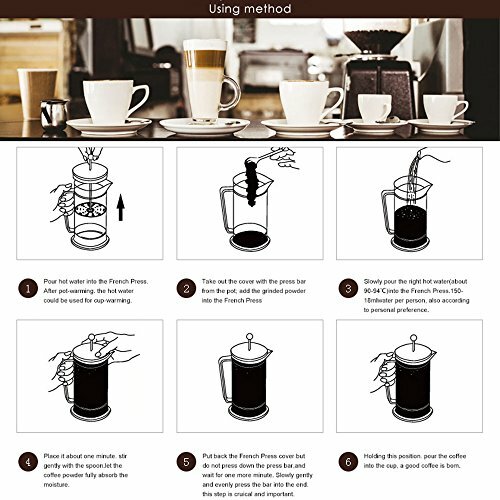 Why Choose the Homdox French Press Coffee Maker? -Compared to a small amount of disposable filter features multiple inputs, the metal filter can be recycled is more economical and practical. – Variety of uses. 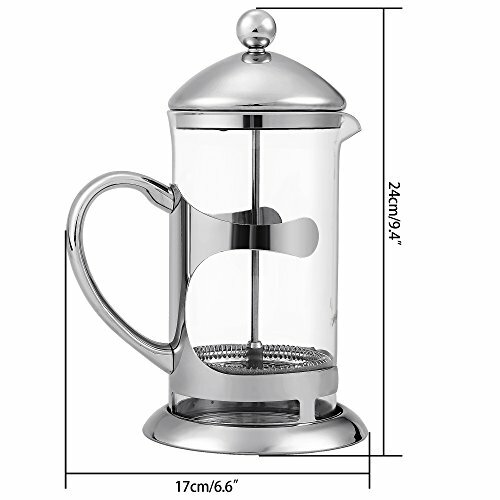 The French Press can be used as a Coffee or Tea Press Pot and is one of the best ways to prepare coffee, tea, iced tea, frothed milk, hot chocolate, fruit infusions, almond milk, cashew milk, plant tinctures, lemonades, rinse quinoa and more. – This is the best choice for busy people! You are going to obtain an appetizing cup of coffee or tea in a couple of moments having only coarse coffee ground or tea leaves and water. – Easy to clean. All parts are dishwasher secure. – Pull the plunger unit straight up and out of the pot. – For each 125ml/4oz. Cup, put 1 rounded tablespoon of coares ground coffee into the pot. – Pour hot(not boiling) water into the pot. Leave a minimum of 2.5cm/1 inch of space at the top. 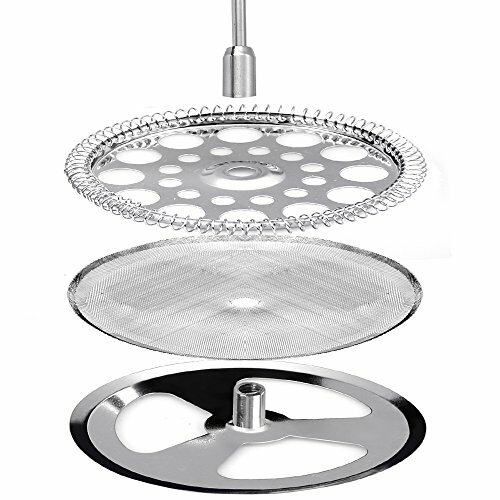 – Place the pluger unit on the top of the pot. Turn lid to close off the pour spout opening. Do not press down.Let the coffee brew for a minimum of 4 minutes. – Lowering the plunger slowly with minimal pressure. – Turn the lid to open the pour spout and then pour coffee. – Unscrew the filter assembly and clean the plunger unit after each use. Get to know us： We created Homdox with a single goal in mind: to make the smart life easier. That means starting with affordable, high-quality gear and ending with a commitment to 100% user satisfaction. In the end, we’re customers too. This Homdox French Press Brews 1 liter (8 coffee cups, 34oz.) of the best rich tasting coffee. Carafe is made of durable, heat-resistant borosilicate glass up to 130℃/266℉. All parts are BPA free. 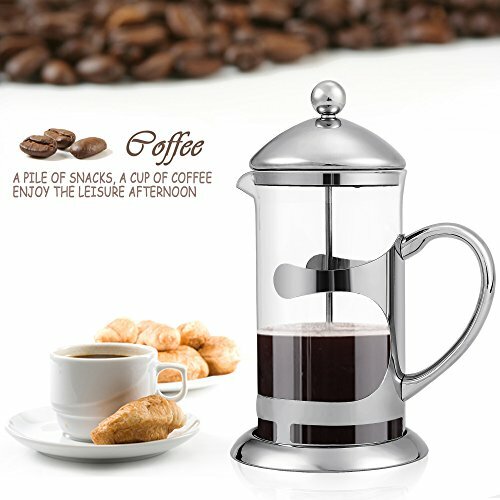 8-cup, 34-ounce french press brew is in a position to serve 2-3 people, offer an amazing rich and delicious smooth coffee erperience. Double-wall construction. 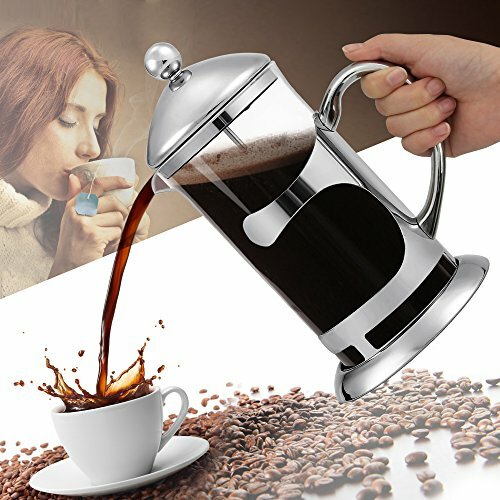 3-part stainless steel mesh filter of this coffee plunger can transfer of 99% of your coarse coffee or tea grounds, extract the perfect flavor and acid from coffee beans, the most popular method to brew for coffee drinker, you’ll be able to decide the concentration of coffee as you wish. With flowing line, auspicious sign, decent and classical design, the result is a modern classic, sure to another 20 years of changing design trends and fashions. 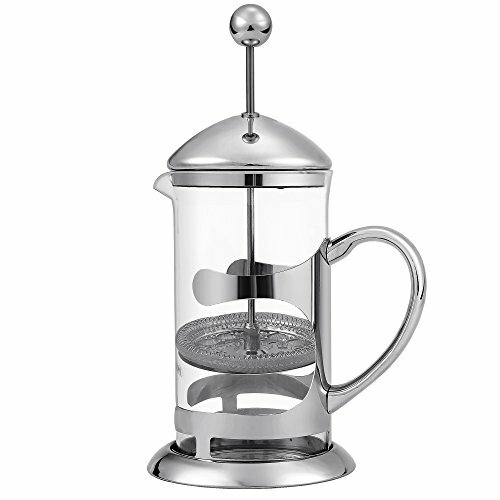 The French Press can be used as a Coffee or Tea Press Pot and is one of the best ways to prepare coffee, tea, iced tea, frothed milk, hot chocolate, fruit infusions, almond milk, cashew milk, plant tinctures, lemonades, rinse quinoa and more.